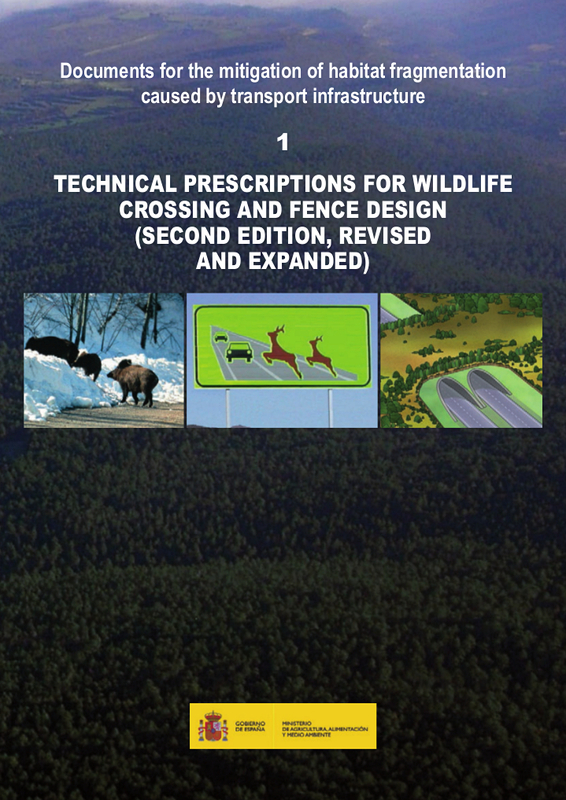 The second edition of Technical prescriptions for wildlife crossing and fence design is an update and expansion of the contents of the first issue (only in spanish) in the series of Documents for reducing fragmentation of habitats caused by transport infrastructure, drafted by the Working Group on the same topic composed of representatives from the Transportation and Environment Departments of Spain’s Regional and National Governments. This Group is supervised by the National Committee on the Natural Heritage and Biodiversity. It is coordinated by the Natural Environment Sub-Directorate General, under the supervision of the Directorate General for Environmental Quality and Assessment and the Natural Environment and the Ministry of Agriculture, Food and the Environment. The first edition was drafted on the basis of the European handbook Fauna and traffic, part of the COST 341 Action project. It specified the technical prescriptions for the design of wildlife crossings and fences, including the minimum standards necessary to ensure the effectiveness of these measures and recommendations for the optimisation of their function. In this edition, the contents have been modified to reflect current knowledge and the best practice on the subject. It aims to provide a new impetus to the implementation of the most effective ways to mitigate the barrier effect and wildlife mortality associated with transport infrastructure, and also to help building safer roads with a lower risk of accidents caused by animals.